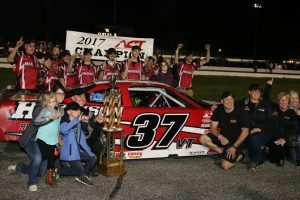 Thompson, Ct. – Eddie MacDonald took control of the American Canadian Tour (ACT) 75-lap season finale at Thompson Speedway Saturday and sped off to a dominant win. Four spots back, Scott Payea nailed down the 2017 ACT championship in the Harrison Redi-Mix No. 37. With his eighth top-five finish in nine races. MacDonald, driving the Hancock Electric No. 17, took the lead briefly from Thompson regular William Wall on lap 12, regained it for keeps on lap 19 and then survived four restarts before drawing away once the race stayed under green. Woody Pitkat was a stout but distant runner-up several car-lengths ahead of a racy, close-quarters duel between third-place Jean-Francois Dery and Dillon Moltz. Payea started 15th. He drew close for a ringside seat to the Dery/Moltz battle, but with a championship in hand, didn’t force the issue. Positions 6-10 went to Wall, Ray Parent, Glenn Boss, Tom Carey III and Rowland Robinson, who raced back up through the 28-car field after a spinout on lap 28. Payea’s well-earned championship season included five wins and eight top-5’s in nine starts. Dery’s run began from sixth on the grid. He was third by lap 12 and held second until Pitkat slipped by him on lap 30. Moltz – the 2017 ACT Runner-up – wound up the year with two wins and six top-5’s. Macdonald’s win was his 16th ACT career victory.